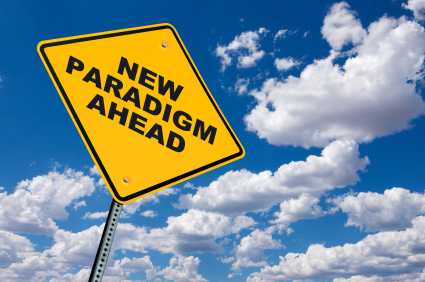 Digital tools are transforming essential elements of the education space. Understanding how they are impacting teaching and learning will help guide your consideration of which tools are useful and how to best implement them. Increase collaboration: Just as social media has given rise to new definitions of community, digital tools are transforming community and the give-and-take between students and teachers. Platforms for web-based discussion threads and creation of course or class wikis alter the types of student involvements in project-based and writing-specific assignments. A piece of student writing can become a diverse and substantive document when it is the basis for a step-by-step exchange of ideas and questions between teacher, peers, authors, and mentors. 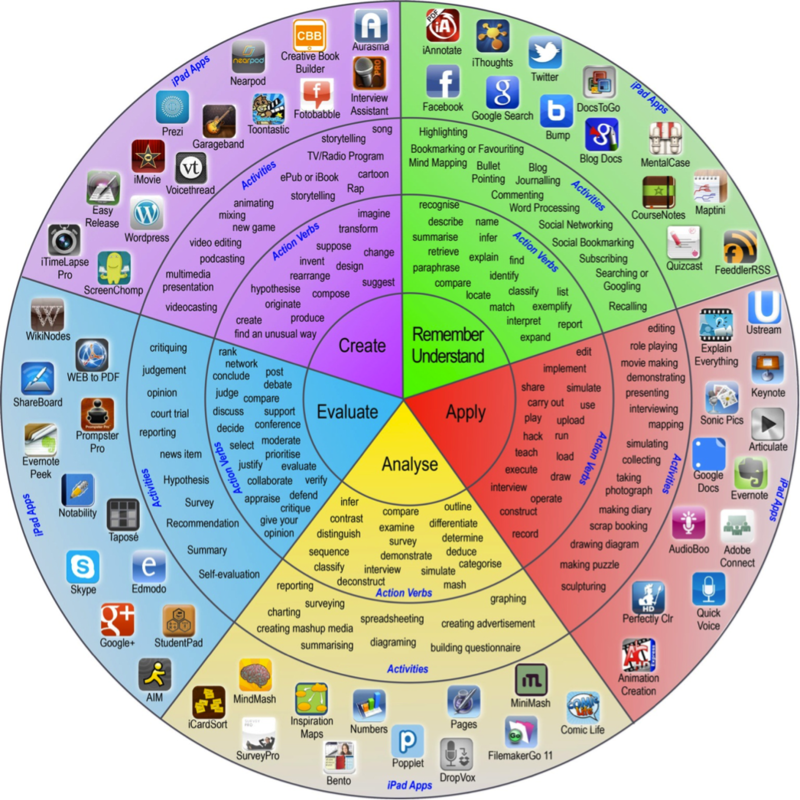 When digital tools are integrated in a pedagogically sound fashion they also promote and enhance other essential skills sets such as communication, creativity, critical thinking, problem solving, digital literacy, entrepreneurship, global awareness, and digital responsibility/citizenship. Innovate assessment: As formats and contexts for assignments evolve, the methods of assessment has had to keep pace. The openness of the online environment and the integration of such things as game attributes, shape all kinds of assessment, especially formative assessment, which measures learning progress (not only endpoints in learning). Enable learning about information and research: Research projects will always require substantive research, accurate and relevant synthesis, and defined audience-oriented approaches. However, in an information-saturated world, students are drawing on tools that help them analyze and understand multiple representations from a range of disciplines and subjects, such as texts, data, and photographs. Transform time-frames around learning: In many instances, digital tools offer an asynchronous (not simultaneous) environment for response and inquiry not present in brick-and mortar environments. Written and video discussions online can enable diverse views, opportunities for collaboration, and time to think and plan before responding in ways that in-class discussions do not provide. This is true for both online classrooms as well as “blended” classrooms, those integrating online and digital tools into a traditional learning setting. Ownership of learning: According to John Dewey, the type of activities that stimulate real involvement "give pupils something to do, not something to learn; and the doing is of such a nature as to demand thinking, or the intentional noting of connections; learning naturally results". There are thousands of free digital tools available that promote the art of doing. Students can now pick the best ones in order to create an artifact that demonstrates conceptual mastery through the construction of new knowledge as well as the acquisition and application of essential skill sets. The process of choice increases engagement, authenticity, and ultimately more value in the learning process. Unleash the power of digital tools and empower students to take ownership of their learning. By no means is this list exhaustive. With that being said, what would you add? How do you see digital tools transforming teaching and learning? THE MAKER MOVEMENT is a global community of inventors, designers, engineers, artists, programmers, hackers, tinkerers, craftsmen and DIY’ers—the kind of people who share a quality that Larry Rosenstock says “leads to learning [and]…to innovation,” a perennial curiosity “about how they could do it better the next time.” The design cycle is all about reiteration, trying something again and again until it works, and then, once it works, making it better. As manufacturing tools continue to become better, cheaper and more accessible, the Maker Movement is gaining momentum at an unprecedented rate. Over the past few years, so-called “makerspaces” have cropped up in cities and small towns worldwide—often in affiliation with libraries, museums and other community centers, as well as in public and independent schools—giving more people of all ages access to mentorship, programs and tools like 3-D printers and scanners, laser cutters, microcontrollers and design software. Making is a process – As with any process, making requires the ability for educators to give up control and trust students. It can be messy and unpredictable, but the products students create, problems they solve, and questions they answer become learning relevant learning experiences they value. Making is guided by a student’s natural inquiry and self-directed learning. Specific skills are require of students, the first of which is knowing what tool to use and how to use it safely. The second involves problem-solving and diagnostic skills that are required to figure out why something won’t work, come up with a creative solution, and not get frustrated. 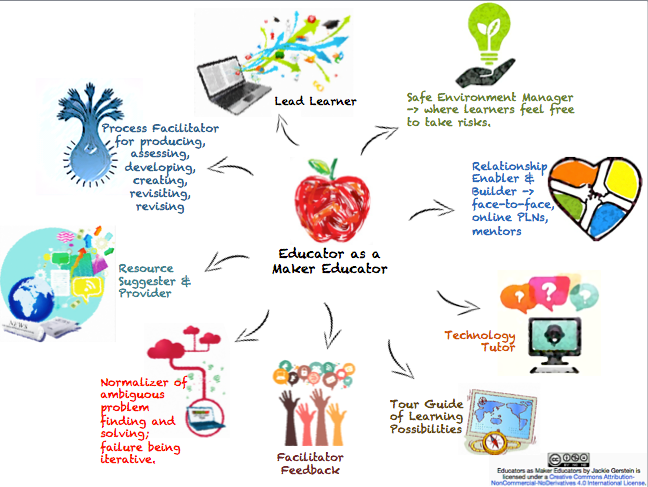 The right educator makes the difference – The process of making requires patience on behalf of an educator who will not have all the answers nor know how to help students out every time they experience a problem. This is quite ok as it is near impossible for someone to have all of the required content knowledge to assist students as they make to learn. The right educator helps students diagnose a problem so that they can create a solution. He or she guides students through the inevitable highs and lows of making something while tying the process and embedded concepts of various maker projects to different content areas. This educator understands that there needs to be a fundamental shift from transmitting knowledge to enabling a student to create his/her own solution. The right person is a coach, models when necessary, and has the mindset of a maker educator. 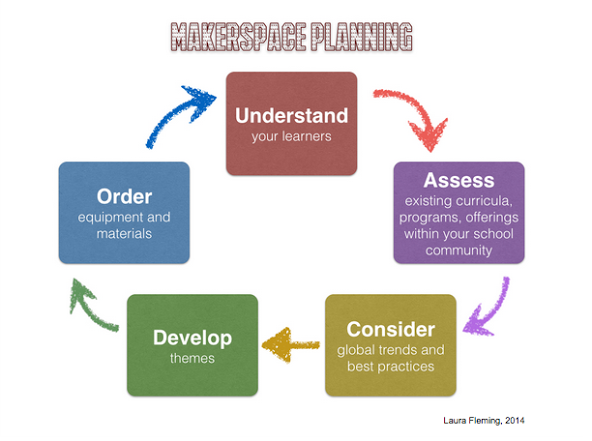 Identify the perfect space – This can be a challenge as available areas to set up a makerspace in many schools are few and far between. The perfect space must encourage creativity and support the idea that anything is possible. It should contain comfortable seating, have limited rules and control, be flexible, have ubiquitous access to WiFi and technology, and infuse prompts and guides to promote inquiry. Possibilities include the library/media center, classrooms, or a common area of the school. You can even develop a pop-up makerspace or a makerspace on a cart. The possibilities are only limited to your imagination. Once you understand the essential qualities to create the perfect makerspace or environment for your students it is time to begin planning. There is no need to reinvent the wheel here are there are many resources available. For a curated list of online resources related to makerspaces check out this Pinterest board. To learn more in depth about the concepts associated with making be sure to purchase the book Invent to Learn by Gary Stager and Sylvia Martinez. Laura Fleming's World's of Making website has everything you need to get started, including suggested items to outfit the space with. She also has generated a step-by-step flow chart pictured below that will assist you in your makerspace planning. For a maker culture to succeed and thrive in a school, leadership matters. I learned some of these lessons unbeknownst to me as they were only brought to my attention after making to learn became an embedded component of our school culture. Selecting the right person to lead the initiative is pivotal. Once that is done give him or her the autonomy to make decisions related to the space and process. Ensure that there is a mutual understanding of the freedom to execute on innovative ideas and create a space that is always in a state of controlled chaos. Provide encouragement every step of the way, as there will be times when equipment does not work or fellow colleagues attempt to undermine the process due to their own insecurities. Finally, make sure there is an allocated budget for the maker educator to establish a space that attracts students. In simple terms, get out of the way.